Make your chore disappear quick with this high grade, rust resistant, aluminum construction folding cart! Load up to 330 lbs of dirt, plants or bricks through the removable front gate and get it done with ease. With its sturdy handles, loads move easily riding on 20" pneumatic tires. When finished, the cart collapses and folds into itself, requiring only 2 sq feet of storage space. It has a retractable handle lock that keeps it folded so it will fit in the trunk of your car, closet, garage, almost anywhere! The Fold it opens in less than a minute by releasing the spring action handle when needed for your next project. 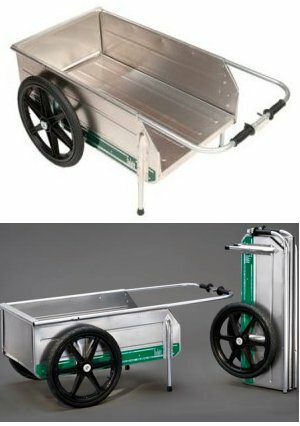 The perfect cart to take camping, boating or on bike trips. Measures 55L x 30.25W x 23D. Made in the USA. I have a very unusual task for this device which will require modifying the box. I am not finished with that, but I have determined that the box is the right size so the mods will be minor. The main point is that I have tested wheels and they will carry my load over the rough terrain here in New Mexico. I never doubted this would be the best cart/wheelbarrow that money could buy. I just had to wait until I had the money to spend on it. As I expected, it is very durable, weight is easily distributed over axle for effortless use. Neighbor plans to order one for beach use. Ironically, I purchased it for ability to fold up and hang, but I use it so often I may never fold it up. I deliver and set up portable buildings, most often used as backyard storage sheds. Often I park my truck on the street and haul the building into the customers yard with a Mule building mover. Then I get my Tipke off the truck to help with the setup and leveling. I load it up with concrete blocks in and throw on a jack, a level, a shovel and some shims. It saves me a lot of walking and I really like the way it folds up because space is tight on my truck. Some times I put several hundred pounds of blocks in at once and it does well. It can tip up on its end if you leave weight by the tailgate and unload the end toward the operator position. I say that as a note and not really a complaint. I like the design of this product and it is wellmade. There is really nothing I would change. It will do great around the yard, but the best is how it folds for storage...and to fit in the car. It will be my new cart for outdoor festivals cooler, chairs, etc and an easy roll into the venue! !